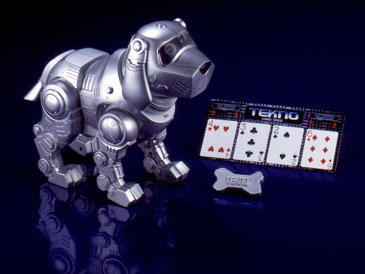 Robot (electronic) dogs are the craze this Christmas season (2000). You can reach our coverage, product reviews and other information about them from this page. If you are manufacturer or a major distributor of a robot dog and would like your pet reviewed here, please email us by clicking on the mailbox at the right. If you are aware of any robot dogs that do not appear on this page (including the list at the bottom of the page) please drop us a note on them. Robotic dog from Manley. Techno does not recognize voice commands. He talks, sings and even has an alarm clock. MGA Entertainment's "soft" robotic dog. This unit is much more "cuddly" than the mechanical dogs. From Tiger Electronics', I-Cybie is a voice activated robot that even avoids obstructions when he walks around. He is a muchj more advanced pet than Tigers' Poo-Chi. Fisher-Price's robot dog has a bright red nose and is one of the most colorful robot dogs. Lupus 2000 and Lupus Jr.